At the 36,000-student University of North Texas, in Denton, the guiding principle of the foodservice program is simple: “Everyone eats, so everyone counts.” For Executive Director Bill McNeace and his team, that means making sure that there is something for everyone, and that the desires of student customers are never forgotten or ignored. The way that simple premise plays out at UNT is what led judges to select it as the 2012 Goldies Award winner in the category Food Democracy. 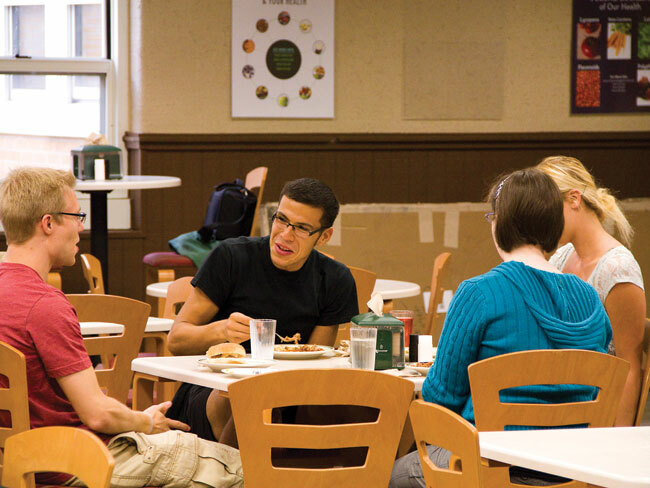 As you might imagine, dining services is a big deal at UNT: More than 5,000 students on meal plans eat at one of five dining centers, and many thousands make their food choices from one of 18 retail outlets in the student center and elsewhere. It adds up to $15.7 million in annual revenue for the dining program. The options for customers range from the national—Einstein Bagels, Chick-fil-A and Starbucks—to the ‘homegrown’—Park Place Market, The Avesta and University Burger Company—to the mobile—Khush Roti and The Angry Friar. Shohreh Sparks leads the residence hall efforts, while Kim Schroeder heads the retail side. Both of their efforts were heralded in UNT’s Goldies entry. From the dining center side, two cafeterias were featured in the video submission. Mean Greens at Maple Hall, already a popular spot for vegetarians, became hard-core this past year when it was converted into an all-vegan café. Ken Botts, project director for dining services, says the concept has become a destination not just for vegans but for students with a wheat intolerance—many items are also gluten free—and for students who might enjoy meat but who want to eat more healthfully. But students who long for “down-home” cooking have their spot, as well, at West Cafeteria. 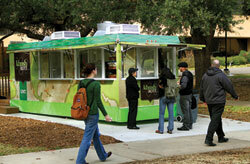 On the mobile side, UNT offers customers a couple of options. One is a food truck called Khush Roti, which Botts says “celebrates the panini in an international way.” Nine types of paninis are available, including The Alamo, which is brisket and cheddar drizzled with barbecue sauce and served on jalapeño cornbread; the Tandoori Naanwich, which is chicken breast marinated in ginger, garlic and yogurt with oven-roasted potatoes and sautéed onions on grilled flatbread; and the Ricky Ricardo, which is Cubano-style brisket with oven-baked ham, melted Swiss cheese, sliced crispy dill pickles, mayo and mustard served on a ciabatta bun. 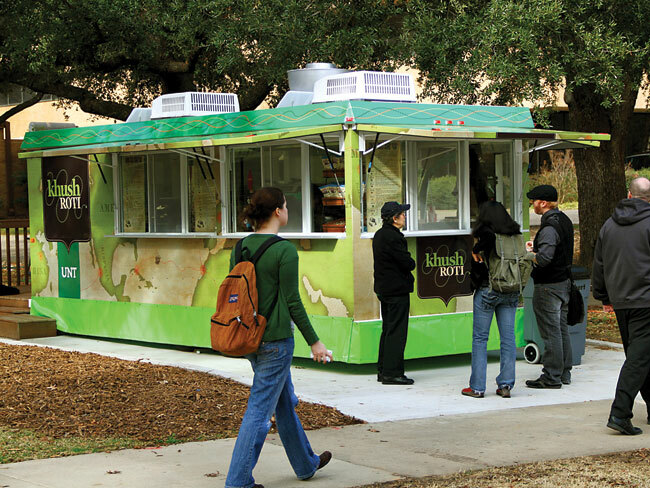 “Students were asking for more options on campus, but with our student union maxed out we really couldn’t build any more in that area, so our only option was intercept marketing, out on the campus grounds.” Khush Roti is set up in a heavily trafficked classroom area. Customers in the mood for fish and chips can go to the alley behind the Language Arts Building, where The Angry Friar sits, a double-decker bus converted into a restaurant. 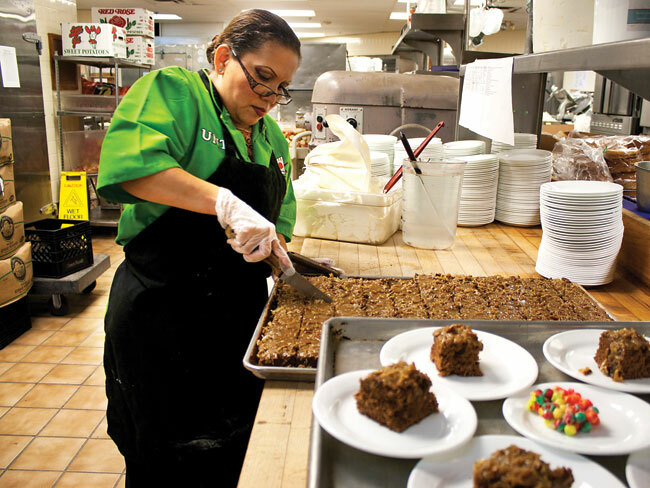 But for the dining services staff at UNT, Food Democracy is not just about making sure that every type of student food preference is served. It’s also about making every student’s voice heard. 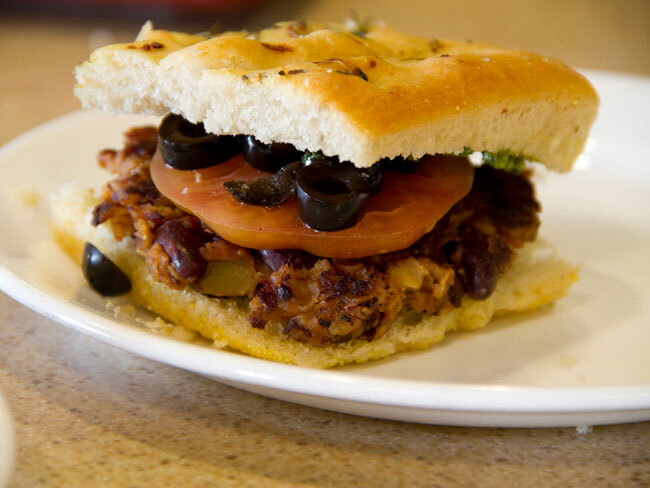 Khush Roti, which features paninis with an international flair, is an example of how UNT take foodservice directly to customers. Students—both customers and employees—are integral to the success of UNH's food democracy efforts. Dining services at UNT gives students every opportunity to have their voices heard when it comes to the menu. Scratch cooking and baking are one of the hallmarks of the program. 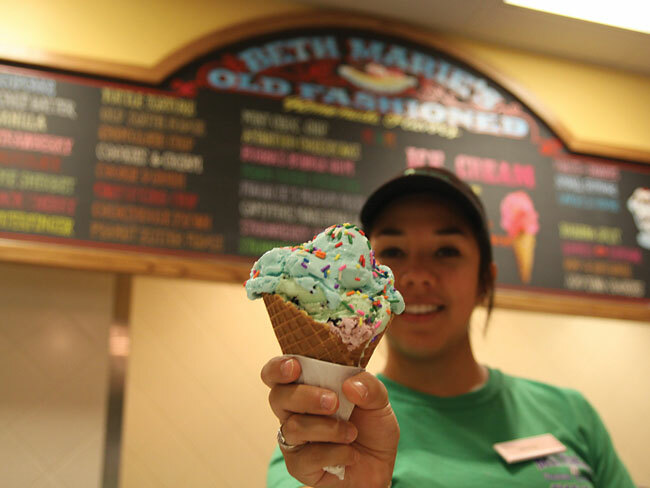 Retail outlets on campus are a mix of national brands and local concepts such as Beth Marie's ice cream. 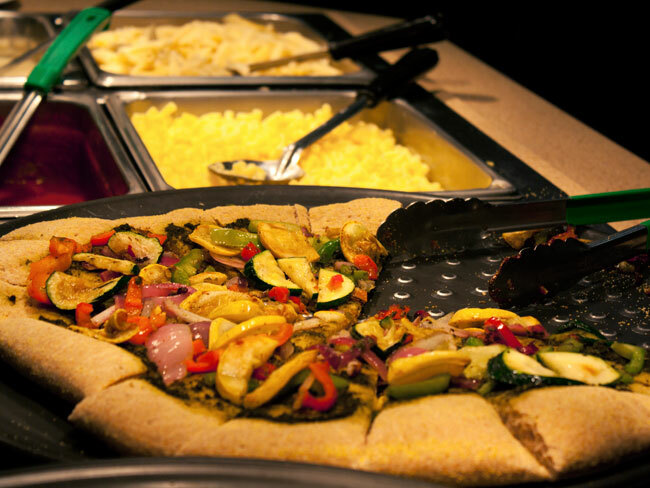 Mean Greens is more than a mad salad at UNT; it's also the campus's all-vegan café. 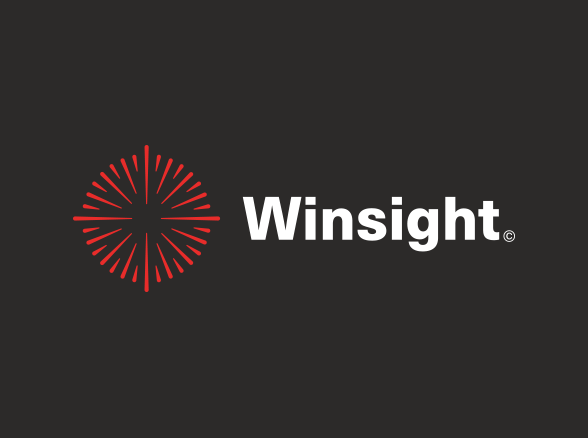 Feedback is collected and responded to as soon as possible. 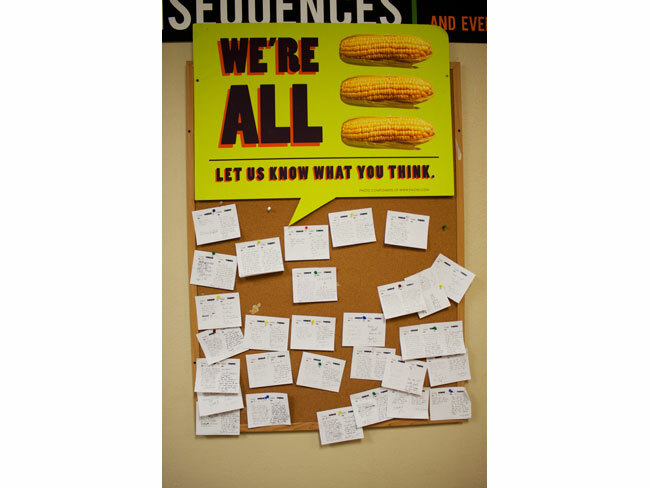 Recipes from Home offers students the chance to submit family recipes to the dining hall.